Greetings from aboard the Sightseer Lounge car on Amtrak’s California Zephyr, gliding across north-central Illinois farm country on the way to Denver, where I am covering the American Public Transportation Association Rail Conference for Trains. Coming from my home in Washington, D.C., I connected in Chicago from a 3-hour-late Capitol Limited, on which I experienced for the first time Amtrak’s cold, boxed replacement for cooked-to-order dining car meals, which the company dubs “fresh and contemporary dining.” More on that in a minute. There's something missing from the atmosphere of this former Superliner dining car, now a 'sleeping car lounge,' on the westbound Capitol Limited on June 6, 2018. All photos by Malcolm Kenton. It has become obvious to even causal observers of Amtrak that former Delta Air Lines chief Richard Anderson, now in his seventh month at the sole helm of the national rail passenger carrier, is not afraid to rock the boat in ways that his predecessors shied away from. He has made major changes to the passenger experience and to ticketing policies and has shaken up Amtrak’s relationship with its customers who own and manage private cars and coordinate charter trains. But there is one key respect in which Anderson has shown no willingness to break from a counterproductive mold that has bedeviled the company since its creation: he clings to the fanciful notion that Amtrak can cut its way to prosperity. Anderson’s short-sighted rationale for the decisions that have drawn the most ire from some of Amtrak’s staunchest allies, as stated in a letter he wrote to two private railcar owner organizations on May 29, is that they are consistent with what Congress has mandated of Amtrak in its 2009 and 2016 authorization laws: that the passenger railroad run a safe, efficient, cost-effective national transportation system while minimizing federal subsidy. But cutting costs is not the only way to boost the bottom line and reduce the need for government assistance. Amtrak's vegan wrap boxed dinner, one of four dinner choices now offered to sleeping car passengers on the Capitol Limited and Lake Shore Limited. Anderson should be applauded for a few initiatives, primarily the solicitation of bids for the badly needed replacement of the Genesis diesel locomotive fleet, which is showing its age in the form of more frequent mechanical problems. The implementation of airline-style computer-generated tags and claim checks for checked baggage to replace the pre-printed stock of tags, if it is shown to actually save money, is another example of a measure that has no negative impact on the passenger experience. I also look forward to being able to select a seat in advance and use coupons without having to call the 800 number — though these shouldn’t come at the expense of a sufficient number of station staff (particularly in areas with poorer Internet service and with significant non-Internet-using locations) and call center agents. Anderson is furthermore right to be focused on improving on-time performance. Yet most of the changes Anderson has enacted, like most made by Joseph Boardman before him, are attempts to shrink costs, with no attention seemingly being paid to the revenue side of the ledger. Amtrak could be focusing its efforts on winning new customers, particularly to the National Network trains, by increasing train frequencies or by truly improving the product, such as with a significant order of new passenger cars. Of course, major undertakings like this require a long-term consistent effort in concert with Amtrak’s allies to find the necessary funds. The lone boxed breakfast option offered to sleeping car passengers under the 'fresh and contemporary' on-board dining model. If passenger rail is to survive and thrive in the USA, train operating companies need to find ways to pad the revenue column, and not just shrink the cost column. As evidenced in the other hospitality industries, firms have to spend money up front to create a more desirable product in order to increase revenues long-term. The way to address complaints about the limits of a product offering is to offer the customer more options, not fewer. Even if a change that substantially alters the quality of the overall product is made in response to customer requests, if a company’s most loyal existing customers see it as a cheapening of the product, then it is not, in sum, an improvement. Which brings me back to the boxed meals. For what they are, they aren’t bad — a touch above what a similar cold meal would be on an international flight. The fruit in both the dinner and breakfast boxes was fresh, the muffin and banana bread had the right consistency, and quinoa and edamame salad and Kind and Kashi bars are welcome additions to Amtrak’s offerings. I would have applauded the introduction of some of these items in addition to traditional dining car fare — but not as a replacement. The former cafe serving area of a 'Cross-Country Cafe' Superliner diner, now used to serve the boxed meals and beverages. The cafe on the Capitol Limited has returned to the lower level of the Sightseer Lounge and is now the only food option for coach passengers on the train. When one has grown accustomed to cooked-to-order hot meals served in a comfy rolling restaurant setting, enjoyed with fellow passengers, this feels like a downgrade. Something of what gives American train travel its soul is missing. I realize that joining strangers for a meal on a train is not everyone’s cup of tea, which is why sleeping car passengers have always had the option of having their meal served in their rooms. But now on the Capitol Limited and Lake Shore Limited, the former diner — now a sleeping car passenger lounge where passengers may choose to eat their boxed meals minus tablecloths, silverware and other accoutrements — feels sterile. Without the imposition of community seating, one feels awkward seeking to strike up a conversation with other passengers, so those traveling together tend to keep to themselves. The green reusable bags in which the boxed meals are served, either picked up at the counter in the ex-diner or brought to your room by your attendant. Passengers may keep the bag or give it back. Real revenue growth can only be achieved with a visionary, expansionary approach to what American passenger rail can be. Sadly, Congress has been unwilling to provide the kind of seed money that would need to be spent up-front in order to come closer to long-term financial sustainability. Congress may have boxed Amtrak into a corner (pun intended) with the statutory mandate that the company end losses on food and beverage service by Sept. 30, 2020. But I don’t think the railroad’s current management has thought enough outside this box. 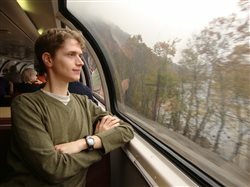 If sleeping car fares are going to continue to rise and coach passengers are going to be left with only the meager cafe car offerings for long overnight trips, then passengers and the organizations representing them are right to demand a better approach.